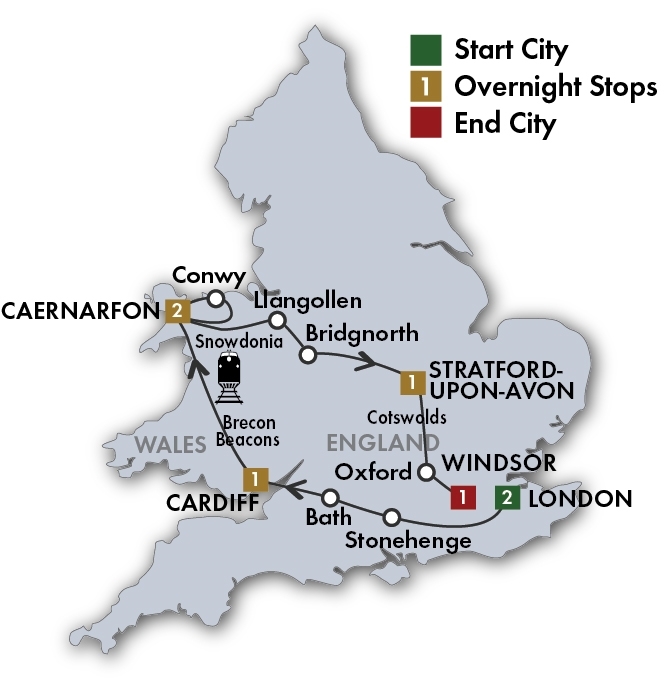 CIE Heart of Wales & England Tour - CIE Tours International tours. Lowest Prices! Admire the beauty of Snowdonia National Park as a narrow-gauge train takes you through the heart of the region. Gain insights into the histories of Conwy, Oxford and Windsor as your local guide recounts facts and local lore on walking tours of these towns. Caernarfon Castle Mighty Caernarfon is possibly the most famous of the castles throughout Wales.Begun in 1283 by Edward I, Caernarfon was constructed not only as a military strongholdbut also as a seat of government and palace. Explore its huge walls and towers as youlearn about its history and use from your guide. St Pauls Cathedral, LondonStPauls Cathedral, London The present cathedral, built by Britain's most famous architect Sir Christopher Wren, is at least the fourth to have stood on the site. It was built between 1675 and 1710 and services began in 1697. See the breathtaking view of the Nave and the many treasures contained within the walls of the cathedral. Shakespeare’s Birthplace This carefully restored 16th century half-timbered house in Stratford-upon-Avon is where William Shakespearewas born in 1564 and spent his childhood years. See an exhibition on Shakespeare and his times before walkingthrough the house, now restored to look at it would have been in his day. Snowdonia Train RideTrain Ride in Snowdonia Snowdonia is the mountainous region in North Wales with Mount Snowdon being the highest peak. A narrow-gauge rail trip is fun and will show you some of the glorious mountain scenery. Stonehenge is probably the most important prehistoric monument in Britain. The circle of vast monoliths date from about 3,100 B.C. and are built from bluestone, sarson and Welsh sandstone. It is aligned with the summer solstice and is believed to have been built for lunar and solar worship. Tower of London Founded in 1066 as part of the Norman Conquest of England, the tower has played an important part inEnglish history for the past millennium. See the White Tower, dating from 1078, view the pricelessCrown Jewels and learn about all the monarchs associated with the Tower. 7 breakfasts (B) and 4 dinners (D) including a lively Welsh Banquet in Cardiff Castle on most departures. Tour begins 2:00 PM at your London hotel. Take a panoramic tour of central London to see famous landmarks. Stop at St Paul’s Cathedral to tour the awe-inspiring interior. Enjoy a welcome drink with your group.